The DAP-2610 Wireless AC1300 Wave 2 Dual-Band PoE Access Point is designed to support small to medium business or enterprise environments by providing network administrators with secure and manageable dual-band wireless LAN options, and utilizing the cutting-edge speed of Wireless AC. The DAP-2610 delivers reliable, high-speed wireless performance using the latest 802.11ac Wave 2 standard with maximum wireless signal rates of up to 400 Mbps (256-QAM) over the 2.4 GHz band, and 900 Mbps over the 5 GHz band1 . This, coupled with support for the Wi-Fi Multimedia™ (WMM) Quality of Service (QoS) feature, makes it an ideal access point for audio, video, and voice applications. When enabled, QoS allows the DAP-2610 to automatically prioritize network traffic according to the level of interactive streaming, such as HD movies or VoIP. The QoS feature can be adjusted through the DAP-2610 web GUI using a drop-down menu to select customized priority rules. Additionally, the DAP-2610 supports load balancing to ensure maximum performance by limiting the maximum number of users per access point. The DAP-2610 allows network administrators to deploy a highly manageable and extremely robust simultaneous dual-band wireless network. 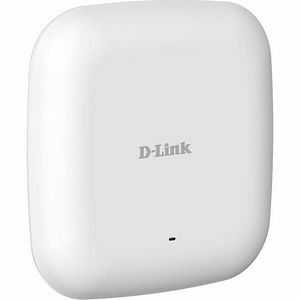 The DAP-2610 can provide optimal wireless coverage over either the 2.4 GHz (802.11b, 802.11g, and 802.11n) or the 5 GHz (802.11a, 802.11n, and 802.11ac) bands. The DAP-2610 can be ceiling mounted, wall mounted, or placed on a desktop to meet any wireless demands. For advanced installations, the DAP-2610 has integrated 802.3af Power over Ethernet (PoE) support, allowing the device to be installed in areas where power outlets are not readily available.